With his uninterrupted three-week work period in the Galerij Prins Willem V almost coming to an end, René Klarenbeek, for the first time working on his CONTERFEYTER series of large scale contemporary history paintings, he is accurately depicting the very space he is in. ‘Paint what you see’, faithfully following the ‘naer de natuer’ rules, is one of the wise lessons he has learned from Master Rembrandt. 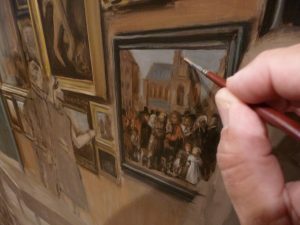 Ninety percent of the working time it merely comes to looking closely, intensely and carefully, with of course at the end of each working day the eyes far more tired than the hand holding the brush. Exceptional, compared to the standards of the ‘Dutch school’ paintings in the collection of the prince, is this rather oversized and over-idealized neoclassical depiction of Eve offering Adam the apple, by the Bolognese master Marcantonio Franceschini (1648-1729). 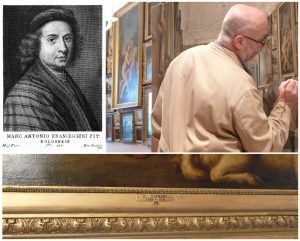 According to the added name on the picture frame, the painting once must have been wrongfully attributed to his teacher, Carlo Cignani (1628-1719). Franceschini’s refined style, depicting gracious figures with porcelain like features is often classified as ‘Barochetto’, a mix of baroque and rococo, which was still highly fashionable when Willem V bought the painting in 1765 at an auction of the collection of the deceased King August III of Poland. 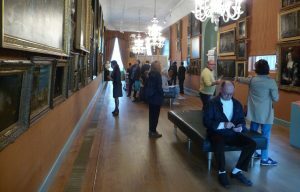 This fairly large canvas must have impressed the visitors to his collection in Den Haag, where it has remained since then as a fine non-Dutch example of the admired classicist Italian painters. In this phase of the painting, the colours on the palette are extended with two important reds. The first is vermilion (= natural cinnabar), a strong orange-red pigment made from mercury sulphide. The second is called kraplak (= natural madder lake), a traditional half transparent lake pigment extracted from the common madder plant Rubia Tinctorum. Both indispensable pigments on the palette are nonetheless rather slow drying in linseed oil. Time to move on to a next quartet of paintings, containing a hunting still life by Jan Weenix, next to a copied portrait of Willem III by Abraham Ragueneau, a ‘smelly’ fish banquet by the Den Haag born Abraham van Beyeren and a gracious still live depicting fruit and flowers by Abraham Mignon. 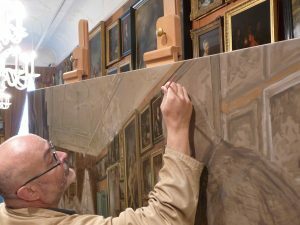 The bright lights coming from the gallery’s chandeliers, which of course will return to this painting at a later stage, make that, seen from the viewpoint of the painter, some of the depicted paintings on the wall will be disappearing behind the light reflection. With painting after the ‘natuer’ as his main approach, also while working in the gallery, René Klarenbeek’s brushes strictly and faithfully intend to depict only what is there to be seen. 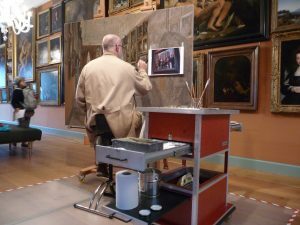 Now it is time to work on the most important painting of the gallery’s collection in this new Conterfeyter painting called DIOGENES. Changing the position of the still life of Abraham van Beyeren with the ‘Diogenes’ painting by Caesar van Everdingen is the only deliberate deviation from the observable reality that René Klarenbeek wants to permit himself. In this Van Everdingen painting from 1652, the tramp-philosopher Diogenes appears as the central figure, in a coarse, monkish habit, his red face indicating an outdoor life. He is roaming the market place in broad daylight, holding out a lamp. Asked why, he says he is looking for an honest man, but can find none. 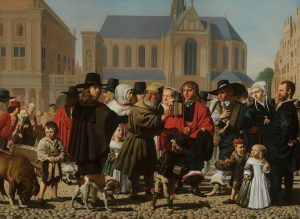 This anachronistic depiction of the Greek philosopher on a Dutch market place is at the same time a ‘portrait historié’ of the Steyn family, in which the different characters are carefully grouped together, but never seem to blend in collectively. All these people are clipped and separated, individually shaded, being part of a busy, blurry crowd. Each individual is there for our examination, one by one. The concealing-revealing glimpses make us very conscious of our observing each individual, even getting slightly disoriented at points, but always attentive. It’s a picture whose focus never seems to relax, which is a clever pictorial effect affirming Diogenes’ own futile seeking for at least one honest man. Being the most illusionistic of all arts, in painting everything is possible, even the horizon might be placed vertically, if desired. In René Klarenbeek’s faithful depiction of the gallery space, changing the position of Van Everdingen’s ‘Diogenes’ will be the only directly visible deviation of reality. Thanks to the hospitable co-operation of the museum’s staff, the ‘Diogenes’ painting by Van Everdingen was even briefly held up on the new imagined location on the south wall of the gallery, to accommodate the painter to photograph its new position as well as its proportion compared to the surounding paintings, combined to its reaction to the incoming light. By using this printed image stuck on an open part of the canvas with two pieces of masking tape, René Klarenbeek will be able to include this three hundred and sixty five year old, anachronistically showing up, seventeenth century depiction of the fourth century b.C. Diogenes in his own twenty first century painting, thus fully in line with the tradition. In a painting with such an enormous distance between the foreground and the background, the ubiquitous rules of the four different forms of perspective will have to be applied. In addition to the well known line perspective, the correctly combined application of both tonal and colour perspective as well as atmospheric perspective will contribute to suggest a convincing three dimensional depth on the still nonetheless two-dimensional flat surface of the canvas. Now that we have arrived in the centre of the long wall covered with paintings, the depiction of Van Everdingen’s ‘Diogenes’ will have to be executed with slightly held in tones, medium less pronounced colours and average sharpness in the brush work. Featured, second and fourth photo: courtesy Nesrine Larache. Second last photo: courtesy Roline Offers.